Marinate the ground beef with the seasonings you like and make four hamburger patties. Grill or sauté them until they are cooked to your taste. Cover the hot patties with the cheese slices so that they melt with the heat. To make the patacones, peel the plantains. Cut each one into three parts and fry them in hot oil, until they turn two shades darker. When the plantains are more or less cooked, remove them from your frying pan and flatten to about one-quarter-inch thick with a plate or a rolling pin. Fry the plantains in batches a second time until they are crunchy, but still tender inside. Transfer to a plate lined with paper towels to absorb excess oil. Salt them while they are still hot. On a plate, place the patacón with a slice of green tomato on top, followed by the hamburger patty with melted cheese and finish it off with another patacón on top. To make the fry sauce, combine the mayonnaise, ketchup and a few drops of lemon juice to taste. You can use frozen hamburgers patties or homemade ones prepared with the marinade you prefer. Patacón hamburgers are usually sold in street stands throughout various cities in Colombia. 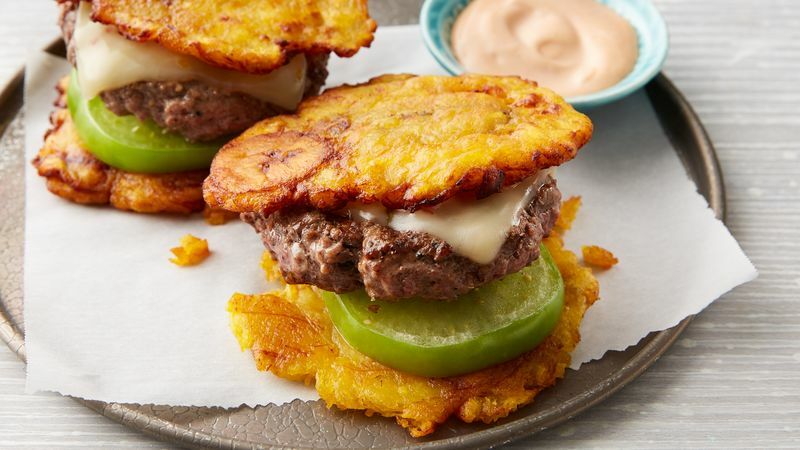 In this dish, we substitute the traditional burger buns with delicious patacones: crunchy slices of green plantain known as tostones in other countries. The best way to dress this dish is with a mixture of mayonnaise, tomato sauce and lemon, also known as fry sauce.